For beginning musicians, Alfred's Easy series is the fast track to developing a repertoire of well-known and fun-to-play songs, while more experienced players will find an excellent resource of favorite songs. The Easy Hits Ukulele format provides melody, chords, and lyrics for easy "strum and sing" performance---plus suggested strum patterns and TAB for any integral "hook" parts. 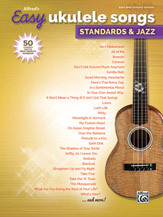 This Standards and Jazz edition features timeless songs from the Great American Songbook, such as "Ain't Misbehavin'," "Five Foot Two, Eyes of Blue," "I'm in the Mood for Love," "It Don't Mean a Thing (If It Ain't Got That Swing)," "Over the Rainbow," "Take the 'A' Train," and many more! Titles: Ain't Misbehavin' * At Last * All of Me * Blue Moon * Breezin' * Caravan * Do Nothin' Till You Hear from Me * Don't Get Around Much Anymore * Emily * Five Foot Two, Eyes of Blue * Gentle Rain * Good Morning, Heartache * Here's That Rainy Day * I'm in the Mood for Love * In a Sentimental Mood * In Your Own Sweet Way * Invitation * It Don't Mean a Thing (If It Ain't Got That Swing) * Just Friends * Laura * Lush Life * Misty * Moonglow * Moonlight in Vermont * Moonlight Serenade * More Than You Know * My Foolish Heart * Theme from New York, New York * Nice 'n' Easy * On Green Dolphin Street * Over the Rainbow * Polka Dots and Moonbeams * Prelude to a Kiss * Satin Doll * The Shadow of Your Smile * Softly, As I Leave You * Solitude * Stardust * Stars Fell on Alabama * Stompin' at the Savoy * Straighten Up and Fly Right * Street of Dreams * Take Five * Take the "A" Train * This Masquerade * Try a Little Tenderness * What Are You Doing the Rest of Your Life? * What's New? * You Must Believe in Spring * You Stepped Out of a Dream.